Sarah F. Suver 88 of Harrisburg passed away Friday, November 9, 2018 at Harrisburg Medical Center. She was born in Harrisburg December 26, 1929 to Frank and Sallie Tavender Conover. Sarah was married to Jim Suver and he preceded her in death November 6, 2013. 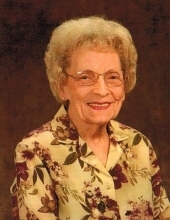 She was a member of the Harrisburg First United Methodist Church. Surviving are her 2 daughters, Debra Suver and Mary Renee Suver both of Harrisburg. She was preceded in death by 1 brother Herman Conover and 2 sisters, Mary Lois Dabney and Madeline Little. Funeral services will be 1:00 PM Wednesday, November 14, 2018 at the Harrisburg First United Methodist Church with Rev. Ron George officiating and burial will follow in Sunset Lawn Cemetery. Friends may call after 11:00 AM Wednesday at the First United Methodist Church in Harrisburg. The J. M. Weirauch Funeral Home is in charge of arrangements. To send flowers or a remembrance gift to the family of Sarah F. Suver, please visit our Tribute Store. "Email Address" would like to share the life celebration of Sarah F. Suver. Click on the "link" to go to share a favorite memory or leave a condolence message for the family.